Snow is falling on the aspen tree's on a winter morning in Moraine Park. 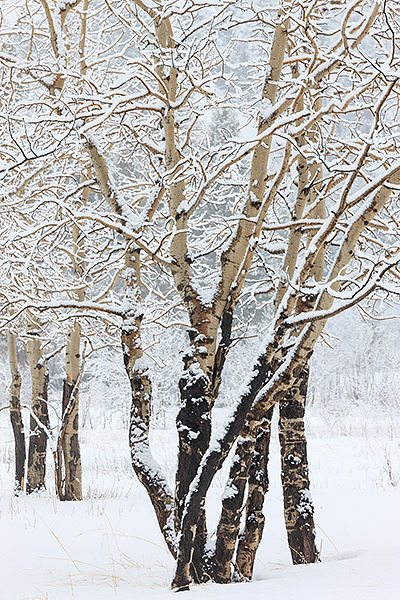 Aspen tree's make beautiful subjects anytime of year, but when coated with snow and white reveal a subtle but enduring beauty. The aspens in Rocky Mountain National Park are set apart from aspen trees in other parts of Colorado by their damaged bark along the base of the tree. The large population of Elk in Rocky Mountain National Park will chew the bark off the trees for food during the long winter months. Photo © copyright by Thomas Mangan.